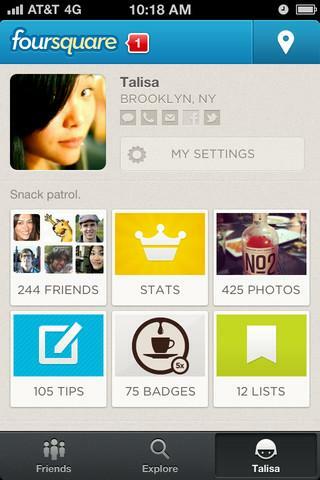 Foursquare has alluded to a new redesign and pivot for some time now. Dennis Crowley once revealed that users were not using Foursquare to check-in, and the company was looking for a solution to better engage its users. On Thursday, the company unveiled its new design and strategy to tackle its waning influence with a brand-new Foursquare. With a treasure trove of data from its user’s check-in habits, the new Foursquare serves as a social media application, recommendation engine, and a deal service, all rolled into one mobile app. At Digital Dumbo’s recent DD:Impact conference, Alex Rainert, Foursquare’s head of product, revealed that Foursquare’s redesign was motivated by its user’s feedback and recommendations. What the users desired wasn’t scalable from their previous iteration. Instead the team had to rework and rebuilt Foursquare from scratch, but this time, as its users had desired, Foursquare placed an emphasis on venue and activity recommendations. 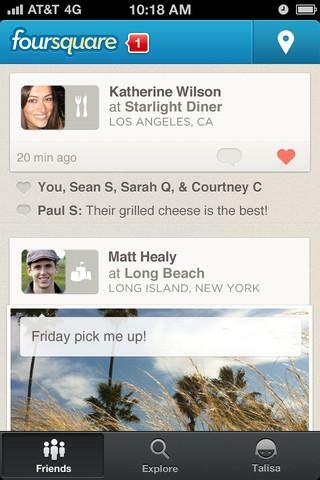 Simply put, Foursquare has evolved into a glorified mobile Yelp. The platform’s user experience is bundled up in a sleeker form factor than its preceding iteration. Its design, inspired by Path and Pinterest, avoids the bells and whistles that would otherwise distract users from the content, and simplifies the navigation. For example, the previous version sported a five-button navigation tab. Now the app has streamlined its navigation tabs to three buttons. Its social media features remains within the left tab, “Friends.” The tab is reminiscent of Facebook’s newsfeed, which is regularly updated with friend’s status updates including comments and check-ins. While the service recommends venues and eateries to users, Foursquare has placed a particular emphasis on making its data and resulting recommendations “smarter,” and this is evident within the central “Explore” tab. Here, based on your current location, visiting habits and your friends’ Foursquare activities, the app’s algorithm will automatically recommend places to sight-see, foods to eat, boutiques to shop at, and clubs to party in, around your residing area. Manual searching is no longer a requirement. The venues are plotted on Google Maps based on places surrounding the user’s current location. A rather new feature to Foursquare is that the app now showcases need-to-know content about each venue. Upon drilling down into the venue’s page, users can browse images tagged to the venue, available deals, and tips and reviews that visitors and publications (like the New York Times) have written. With the number of check-ins decreasing, the core gamification features that once defined Foursquare, including the mayorship, have been relegated to the very bottom of each venue’s page. The “call to action” button for checking-in has been relocated to the top right of the screen, which according to Foursquare allows users to easily access check-ins with the flick of a thumb. The third, and far right tab, enables users to conveniently browse their profile, which is separated into categories including friends, stats, photos, tips, badges and lists. The interface of the profile page is reminiscent of Pinterest’s design, which sorts categories using board-like tiles. While Foursquare has embarked on a bold change that we’re actually warming up to and inclined use, it will take more to keep the company afloat. Foursquare recently publicly announced the departure of its co-founder, and according to one source, the internal team has been churning through restless and unsatisfied employees. 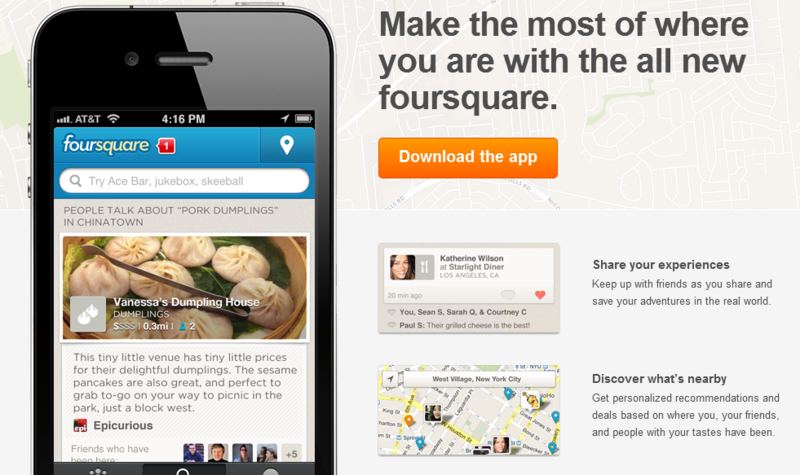 Worse yet, Foursquare has yet to figure out a feasibile monetization model for its mobile application. A lot is riding on this latest update.